Break out the maple-flavored or pancake syrup to make these luscious parfaits. They only take 15 minutes to prep for chill time in the fridge. Microwave nuts, 2 Tbsp. syrup and butter in microwaveable bowl on HIGH 2 min., stirring every 30 sec. Spread onto large sheet of foil; cool completely. Beat pudding mix and milk in medium bowl with whisk 2 min. Add 1/4 cup of the remaining syrup; mix well. Stir in 1 cup COOL WHIP. Spoon 1/3 of the wafer crumbs evenly into 6 dessert dishes; top with layers of half each of the pudding mixture and remaining COOL WHIP. Sprinkle with remaining wafer crumbs. Repeat layers of pudding and COOL WHIP; top with nuts. Refrigerate 1 hour. Drizzle remaining syrup over parfaits just before serving. Looking for a special treat? 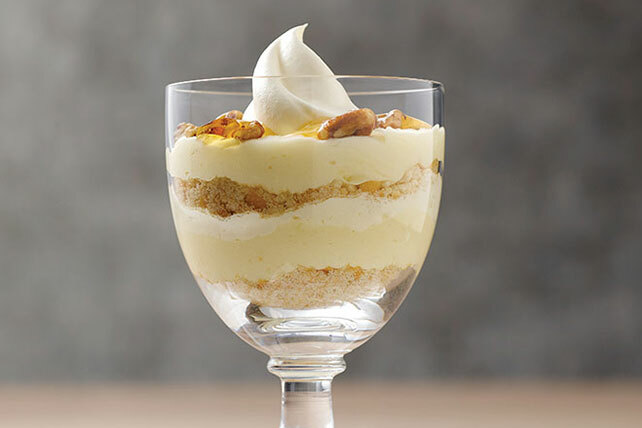 One of these parfaits goes a long way on flavor! Mix additional 2 Tbsp. maple-flavored or pancake syrup with 1 tsp. water. Brush evenly onto wafers before crushing and using as directed.